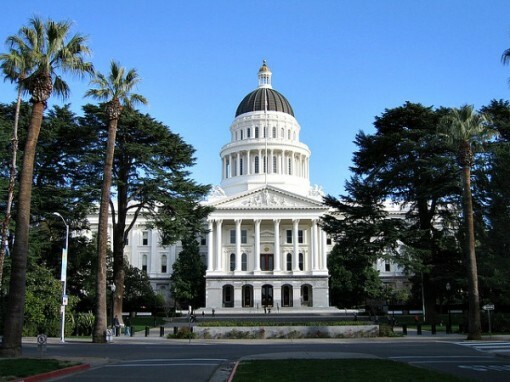 Sacramento is the capital city of California and home to its Capitol Building, a classical revival style patterned after the U.S. Capitol in Washington D.C. The Capitol Building and its grounds are listed on the National Register of Historic Places. 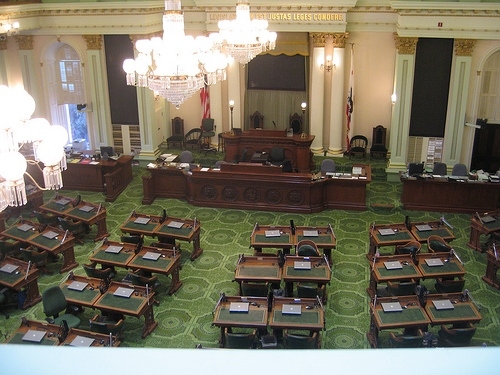 At the center of the building is the rotunda, which divides the State Senate and Assembly into north and south wings. 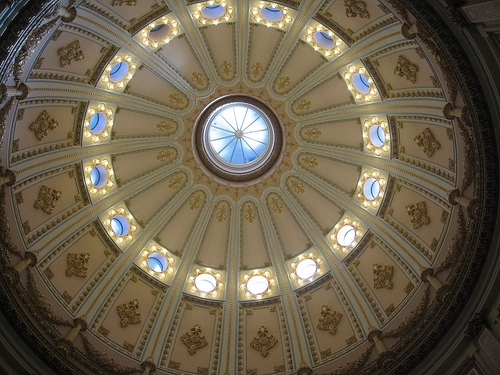 The rotunda is 128 feet tall, from the basement of the building to the height of its inner dome. The Rotunda serves as a ceremonial space, but also as the starting point for most visitors to the Capitol. 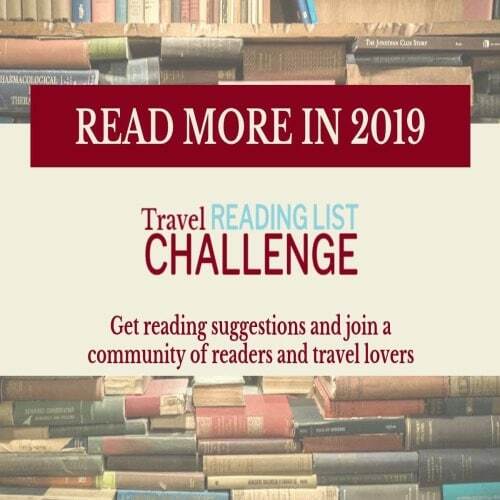 In this area you can sign up for a tour, enjoy a look at some of the decorative murals and interior décor, or look up at the beautifully detailed ceiling. 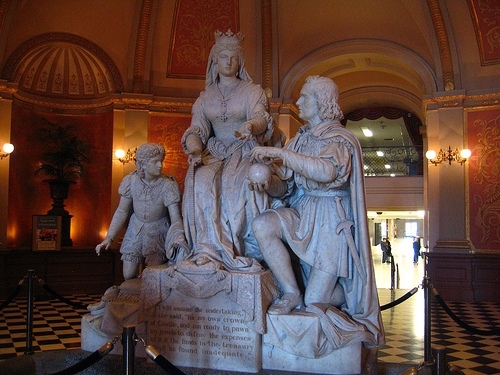 At the center of the rotund is Columbus’ Last Appeal to Queen Isabella, a massive statue carved out of Carrara marble. Slightly larger than life, the statue was placed there in 1883. While seeing it eye-to-eye is impressive, it’s worth the time to go to the second floor and see it from that angle as well. The legislative bodies of the state of California are the State Assembly and the State Senate, both of which were patterned after British legislative bodies. The upper house, or State Senate, meets in a large red chamber, as does the British House of Lords. 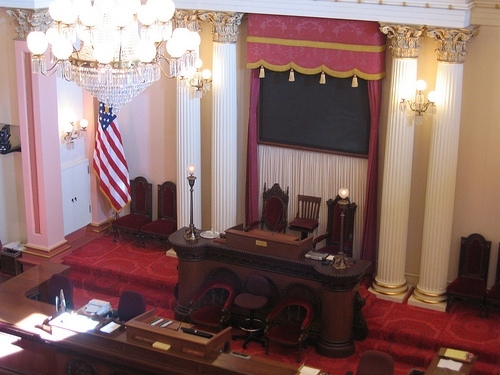 The chamber features Corinthian columns, high arched windows, and dark red curtains. Even the desks and seating area are red. 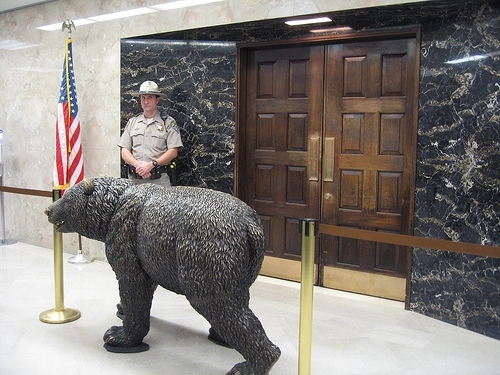 Also housed in the State House is the Governor’s office, guarded by both a bear and a state trooper. A walk through the Capitol Building is a lesson in state history, architecture, art, and politics. Often contentious, usually serious, and sometimes whimsical, a stop off for a guided or self-guided tour is well worth an hour or so of your time. 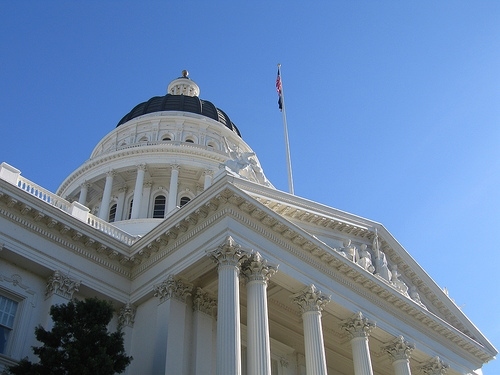 The Capitol Building is located at 10th & L Street in Sacramento. It’s open 8 am-5 pm weekdays, and 9 am-5 pm on weekends. Admission is free. 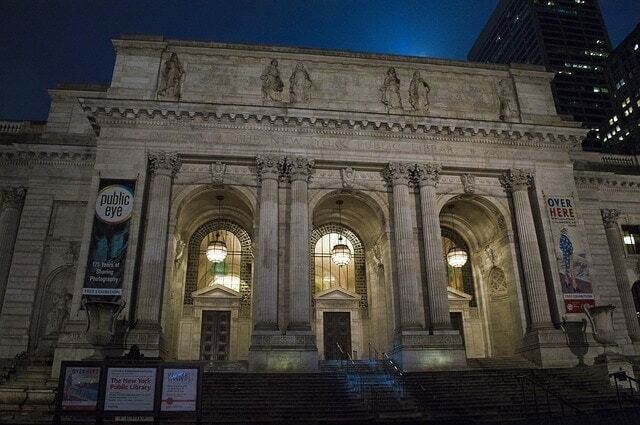 Public tours are conducted daily (also free), on the hour, from 10 am-4 pm. You can check on tours and sign up in the rotunda area. 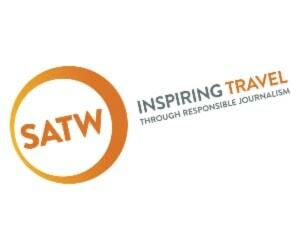 Group tours (10 or more) are by reservations only.